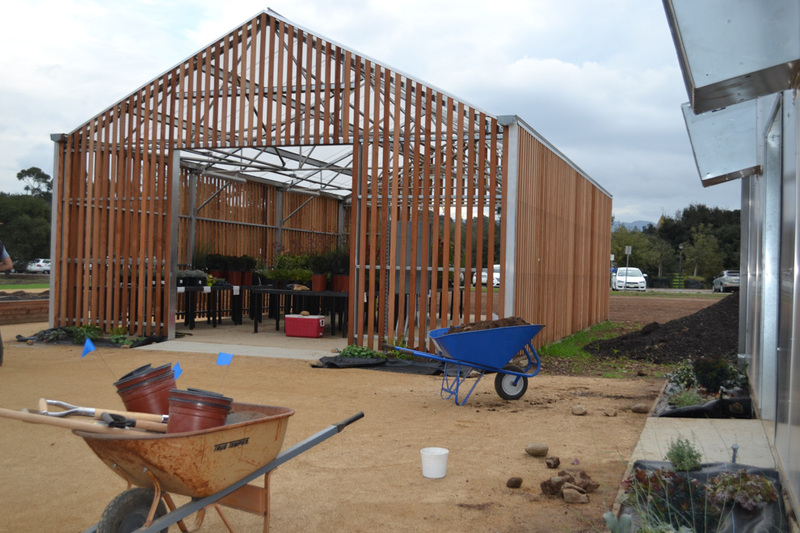 The new farm on the west side of campus will be ready in the spring (VERONICA CRUZ/The Stanford Daily). At the corner of Searsville and Fremont Roads is a dirt pathway bordering acres of cultivated land. Lining the pathway are budding perennials – lavender, manzanita, rosemary – leading up to a covered greenhouse-like structure where farm educator Patrick Archie sits at a table discussing the day’s agenda with fellow farm staff. The O’Donohue Family Stanford Educational Farm, slated to open this spring quarter, is a working farm dedicated to teaching, researching and learning about small-scale agriculture. The near-six-acre farm is the latest installment in spiking administration-side and student-side efforts to promote environmental sustainability on campus. Archie, who is also a lecturer in the School of Earth, Energy and Environmental Sciences, said he sees the University’s rising interest in sustainability as consistent with a rising national awareness of how environmental issues are connected to human well-being, ranging from locally-sourced food to climate change. Zack Gold ’15, president of Students for a Sustainable Stanford (SSS), added that he has witnessed concerns about sustainability trickle down from the administration into quotidian student life, whether in chemistry classes or dining hall conversations. “It’s the issue of our time, and I think a lot of people are taking that to heart,” Gold said. Archie placed his hands on his hips and gazed out at the plots of soil, each blocked off for a different collection of crops – perennials along the walkway, citrus along the bike path, a mixed fruit forest behind the oak trees. “When I came [to Stanford], I told the dean, this is our one chance,” Archie said. He first submitted the initial request for the Educational Farm to the University six years ago. “Now, it’s almost unlimited as far as what we’ll be able to do in terms of engaging people from across the campus and even beyond Stanford,” Archie said. He detailed plans to sell food grown on the farm to Residential & Dining Enterprises and also spoke about implementing after-school programs for local high school students. Gold said he has seen the University grow more and more open to working with students on sustainability initiatives during his four years at Stanford. Having grown up with an environmental engineer for a mother and the head of an environmental nonprofit for a father, Gold said he came to Stanford knowing he wanted to study marine biology. “I’m probably one of the few people at Stanford who still wants to do what they said they were going to do when they were five,” he said. He soon found a community through SSS and Green Alliance for Innovative Action (GAIA), a collective of on-campus sustainability groups promoting inter-group collaboration – only to find that activity within the student sustainability community was, for the most part, independent of Stanford administration. Fast forward to early February, when Gold and fellow GAIA members presented a list of long-term sustainability goals for the University to the Provost’s Committee on Sustainability, an executive committee consisting of deans, institute leads and senior administrators across campus. Today, the University has ramped up its efforts to promote sustainable practices, from offering a wider range of courses related to food and farming – including Archie’s fieldwork-based Earth Systems 180B: Principles and Practices of Sustainable Agriculture – to partnering with Environmental Engineers for a Sustainable World (ESW). ESW will award pedaling-powered bike lights prototyped by the organization to the freshman dorm that wins this year’s Energy and Water Wars. The question of how to create a more environmentally aware campus has been not only on the University’s mind but also on those of student-led environmental groups like SSS. Earlier this year, SSS held its annual Environmental Justice Week with panels about female farm workers in the Central Valley and about the place of environmental justice in Silicon Valley. The panels were co-sponsored by student groups ranging from the Society for Entrepreneurship in Latin America to the Stanford National Association for the Advancement of Colored People (NAACP). Maria Doerr ’17, co-leader of SSS’s Environmental Justice subgroup, explained that SSS is beginning to engage sectors of campus that may not necessarily demonstrate interest in environmental issues. “If we can understand that issues of race, gender, socioeconomic standing, health and environmental well-being are all connected, then we can work together to create something substantial in this community,” Doerr said. Gold cited plans to collaborate with Greek life on promoting environmental awareness and encouraging ongoing dialogue with social justice organizations like the Stanford NAACP. He also emphasized that sustainability matters not only for environmental conservation, but also for social justice. Despite increased University and student group efforts to integrate sustainability into the campus quotidian, other students would argue that the University must take its commitment to sustainability beyond campus boundaries. Stanford, which handles a $21.4 billion endowment, has made waves in recent months for investing in oil and gas companies in the third quarter. These investments follow the University’s divestment from the coal industry last May. “It’s frustrating, because Stanford divested from coal last year saying, ‘We agree climate change is a big issue, and we need to do our part,’” said Yari Greaney, administration liaison for Fossil Free Stanford (FFS). “The next thing you know, they’re investing in oil and gas and stalling our efforts. This winter, students protested the University’s appointment of Mark Zoback to the Advisory Panel on Investment Responsibility and Licensing (APIRL) Environmental Subcommittee. Zoback is the Director of the Stanford Natural Gas Initiative and a Senior Advisor at Baker Hughes, one of the world’s largest oilfield services companies. After FFS began a petition against his appointment, Zoback resigned from the panel two weeks ago. Doerr, who has worked with community gardening initiatives since she was in high school, said she sees a need for students and the University at large to promote sustainability beyond Stanford’s borders. With the Educational Farm expected to open in just a few weeks, Archie said he envisions the farm as a place where students can reconnect with the land and develop the skills they need to effect sustainable change elsewhere. “I think when you’re able to integrate learning into your life is when learning grows exponentially,” Archie said, turning to walk back toward the entrance to the farm. “I hope that this farm will inspire generations of students to connect with one another and to think about how we might make the world a better place. Archie continued up the dirt pathway, past the greenhouse to the newly planted perennials that bloomed near the entrance. He stopped to examine the buds – the first signs of new life.